Remnants Starting at $4.55 sqft. Description - Backed by a waffle pattern that creates air pockets to diffuse sound and vibrations, these gym tiles offer any space the highest level of protection and sound absorption. Made with an anti slip diamond tread surface that water cannot penetrate, our 3/4” Shock Tiles provide a gym floor that will not promote mold, mildew, or bacterial growth. Available in center, border, and corner tiles these shock absorbing tiles can be easily installed in any commercial or residential space. Material – 3/4" Shock Tiles are constructed of vulcanized recycled rubber buffings. Weight – Each tile weighs approximately 16 Lbs. Origin – Proudly made in the USA from start to finish. Recommended Uses – The 3/4” Shock Mats are perfect as garage gym tiles and tiles for cross fit. They have also been used as flooring for commercial gyms, home gym flooring, tiles under equipment, flooring for bumper plates, flooring for Olympic platforms, power lifting tiles, anywhere free weights will be dropped and much more. Free upgrade to beveled edges upon request. Highest level of sound absorption. 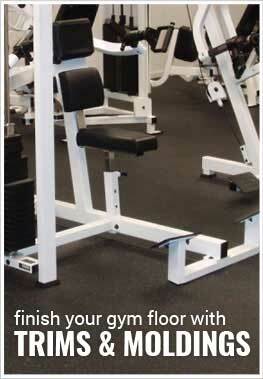 Perfect for home and commercial gyms. Hi, I'm looking into making a home gym and rubber flooring in my mind is necessary. I intend on doing mostly free weights including deadlifts. This is the most important thing though with consideration to flooring, jump roping. I live in an apartment (1st floor) with carpeting. I have two questions. With regards to jump roping, I prefer the minimalist cushion possible as I prefer speed with the exercise. Do you guys offer anything that would be optimal for speed rope (minimal to zero cushioning)? Second, would the flooring damage the carpeting in any way, i.e. stains, chemical run off, etc? Please make any recommendations you feel are helpful and I'll take them under advisement. Thank you! Our 3/4" Shock Tiles are great for speed rope and will not damage the carpeting underneath. If you were concerned that the tiles may damage the carpet, you can place a plastic sheet under the tiles. This would be suggested for installations over light colored carpet. Are the Shock Tiles the same as the Shock Mats? Our Shock Tiles are the same as our Shock Mats just in a smaller tile format. With these tiles, you can create custom sized matting for your space and get all of the sound and shock absorption that our Shock Mats offer. Can this be used outdoors in a children's play area? If so, how well will it hold up under weather conditions? Our 3/4" Shock Tiles can be used in a children's play area, but we do have products that would work better. Your can find these other products in our Playground Flooring section. These products would provide your play area with fall height ratings ensuring the kids won't hurt themselves if they were to fall. Hi, I'm looking for rubber tiles to put over concrete floor to support a treadmill but also provide cushioning, shock absorption for plyometrics. What do you recommend? Our 3/4" Shock Tiles work perfectly under treadmills providing shock absorption, cushion, and sound dampening. These tiles are one of our thickest tiles and are a re-vulcanized tile, making them one of our most durable. Hi, I am looking to create a portable workout area about 3'-4'x6'. I would want to be able to lay it down then move it after I am done. I live on the 4th floor so I would need a product that muffles sound and vibration. I will be doing jump rope as well as other jumping exercises. The room where I would be putting this has wood floors. Would this product be applicable? Our 3/4" Shock Tiles would be a great floor for doing jump training while helping to deaden the noise generated below. This tile features a waffle backing that helps to channel and muffle sound as it travels through the floor. Since it is a tile, you are also able to install and remove the tiles as needed easily. I purchased 50 tiles of the 3/4 inch shock tile for my garage floor. I primarily do P90x workouts and some light weights thrown in occasionally. The floor has a nice waffle pattern on the bottom that provides plenty of absorption when jumping on it which in turn provides cushioning for my joints, especially my knees. I liked the way that it snaps together as a puzzle. It was easy to install. Customer service was excellent and they worked with me in sending out samples to review prior to me making my purchase. I would buy this product again.The one thing that needs to be applied to the website is that ALL these pieces are 22.5 inches, not 24 inches. Make sure you apply the 22.5 inches per tile when you do your build. Rubber flooring was great to work with as they called the manufacturer and confirmed the size (otherwise I would have been short). These are perfect for all exercise. I use them in my basement and do plenty of P90X, Insanity, etc. exercise routines on them. They provide impact resistance and good grip for jumping and moving around. They are heavy enough to not move around when jumping and landing. They are more expensive than the other tiles, but are well worth the price and I know that they will last years for me, especially given that they are for personal use. They were very easy to install. I got the beveled edges and they look great, very professional. While this might be a bit more expensive than the other rubber flooring options, this is the best choice for those that want to do more intense workouts. I am 240lbs and do P90X / Insanity videos or cross fit-like training in my basement. These mats provide shock absorption AND support any jumping or sudden side-to-side movement. They will not slide on you. I got them with the beveled edges and the mats look and feel great. I do a lot of my exercises in bare feet and the mats provide traction even with sweat on them. Spend the extra money on these mats and you will not be disappointed.